Edmund's dev blog for gay nerds: Sticky Meat! 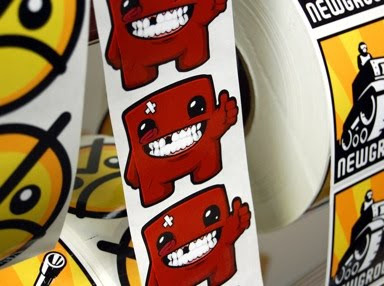 Super Meat Boy stickers have just gone on sale in the Newgrounds store. The stickers are high quality diecut gloss prints and are quite large. And they are only 75 cents! (they get cheaper when you buy in bulk). We are really happy with how they turned out, go buy some now! My gosh, I'm so stoked for this game.